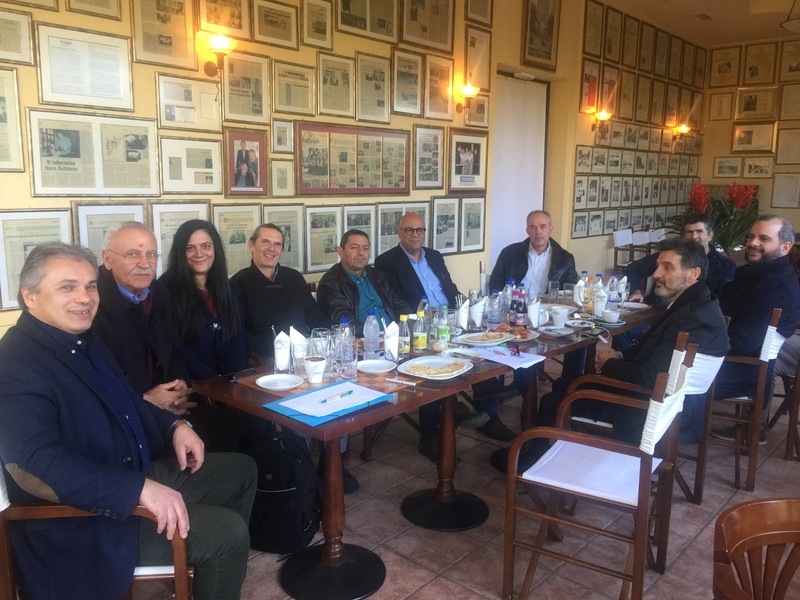 Wednesday, December 12, 2018 at the Historical Café “Kipos” a meeting was held between the representatives of the Hellenic Ministry of Culture and Sports, Mrs. Marianthi Anastasiadou, Head of the Department of International Affairs of the Directorate for International Relations and European Union, Mr. Fotis Vlachos, member of the International Relations Department, Mr. Apostolos Voulgarakis, Deputy Chief of Administration and Electronic Governance Mr. Kyriacos Kotsoglou, Mayor of Chania Mr. Anastasios Vamvoukas, Deputy Mayor of Chania Mr. Kyriakos Kazakos, the President of the Chamber of Commerce and Industry of Chania Mr. Antonis Rokakis, the member of the Board of Directors of EBEX Mr. Spyros Papakastrisios, the representative of Chamber of Commerce and Industry of Chania Mr. Elias Kyriacopoulos and the Founder and President of the European Historic Cafes Association Mr. Vassilis Stathakis. At the meeting they all unanimously reaffirmed the commitment for organize the above-mentioned International Forum “Cultural Routes” of Council of Europe that will be held hosted in Chania in October 2020. The team also started to prepare the agenda on the works to be done due to forum. It is noteworthy that the International Advisory Forum “Cultural Routes” of the Council of Europe’s is an extremely important forum in which participate more than 50 CoE member states and promotes policies on culture and cultural tourism at international, European, national and regional level. It is also a top event on the annual agenda of Cultural Routes. In this international forum experts from each field exchange experiences, review progress and launch new initiatives and partnerships.